Get the Knots Out - Painlessly! The pet grooming comb that gently and safely gets through your pets' tangles and knot with the press of a button! 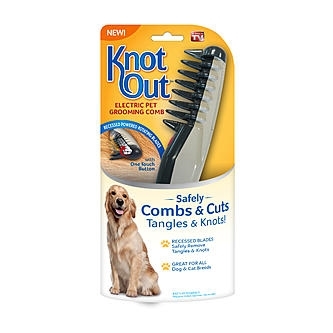 Grooming has never been easier than with Knot Out Pet Grooming Comb! Knot Out, as seen on TV, is the pain free pet grooming tool that combs through tangles and knots safely and with ease. Safety teeth allow the rotating blades to gently massages knots out without hurting the skin. Knot Out glides through thick coats painlessly. Perfect for dogs and cats.